Wonder White... isn't that the name of a bland white bread brand in this country? 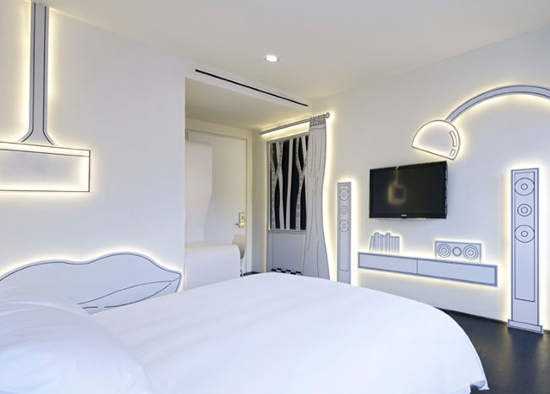 Illumination and illustration ensures this hotel room is a wonder of white in the night. Next time you're schwinging by Singapore you might want to check into Wanderlust? It looks so cool that I think it's now officially on my must see, stay, do list. I can't remember where I found the photo. Soz to whomever I snaffled it from. For Melburnians, Zwei Design used a similar but different 3D graphic/light effect at Caffeinatics newbie at 500 Bourke St (next door to Earl and under Movida Aqui). If you're good I might dig out those pics for you too.